Tired of plain old chocolates for Valentine's Day? Slip these adorable white chocolate hearts into your Valentine's mailbox instead. Just package up a bunch of them in a cute little bag, tie it with some pretty ribbon, and let the romance begin. 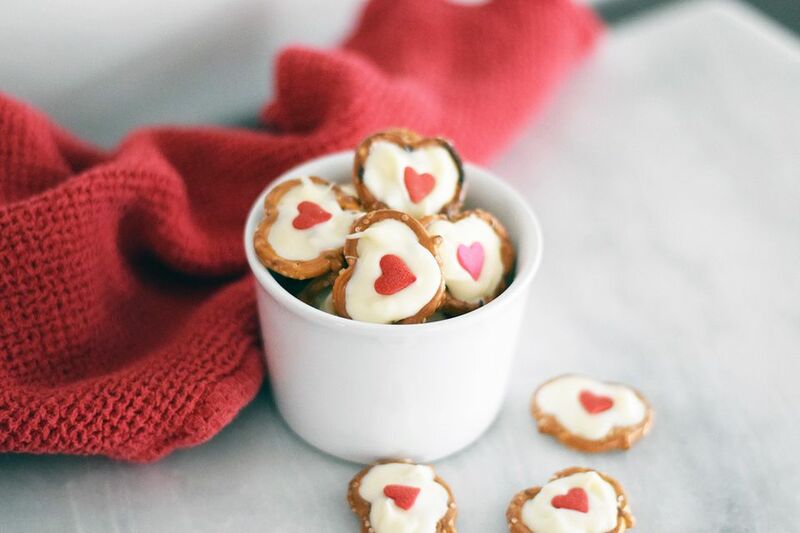 The combination of sweet white chocolate and salty pretzels hearts make these heart-shaped treats irresistible and perfectly poppable. (Just make sure you save some for your hunny, instead of eating all of them while you prep). You can use white chocolate candy melts, white chocolate bars, almond bark or any kind of white chocolate bark for these cute creations. Best of all, they require practically no cooking. Simply melt white chocolate, or a white chocolate bark, and pour it into tiny pretzels and press on the cute little hearts! And while they are the perfect Valentine's Day treat, they can also be used for other holidays and get togethers as well. Feel free to switch up the colors, add chopped nuts, more sprinkles, and customize them for your needs. Bonus: you can easily throw them together last minute, so they make the perfect treat if you waited until the night before for your gathering. They also make a fun, portable, and non-perishable snack for your next road trip or for your lunch box! You can make anyone's day with these adorable treats. Line two baking sheets with parchment paper. You can also use wax paper. Lay down the pretzels on the baking sheets - flatter side down on the paper- making sure the pretzels are slightly separated. Place the white chocolate in a microwave safe bowl and microwave in 30 second increments, stirring after each increment, until it is completely smooth and melted. Place the melted white chocolate in a pastry bag or quart-sized bag. (If the white chocolate is super hot, wait a few minutes to place it into the plastic bag.) Cut off one corner of the bag with a pair of sharp scissors to create a small opening. Squeeze the white chocolate into the openings of each pretzel. Immediately use a butter knife to smooth the top and gently press a jumbo heart sprinkle onto the center. Allow the white chocolate to set for at least 45 minutes before transferring into a storage container. You can also freeze them and they will keep even longer. Or just eat them right away! If you want to try, you can easily freeze them and eat them out of the freezer or prep them ahead of time and serve them when you're ready!